Looking to decorate your classroom or home with an adorable winter project? I have 2 projects that are very easy, low cost and make a big impact. If you have been following me you know I love the outdoors, landscapes and our National Parks here in the United States. I love bringing that outdoor inspiration inside my classroom. First item my little artists created were painted paper trees. They folded a 9″ x 6″ inch piece of previously painted paper in half. Being sure to start in the corner of the folded paper, they drew half a triangle using pencil. Once the paper is open it will be symmetrical. Students added lines with white oil pastels and white tempera paint to give a more graphic look. Students created paint paper earlier in the year and we stored it until we needed some vibrant construction paper for projects. 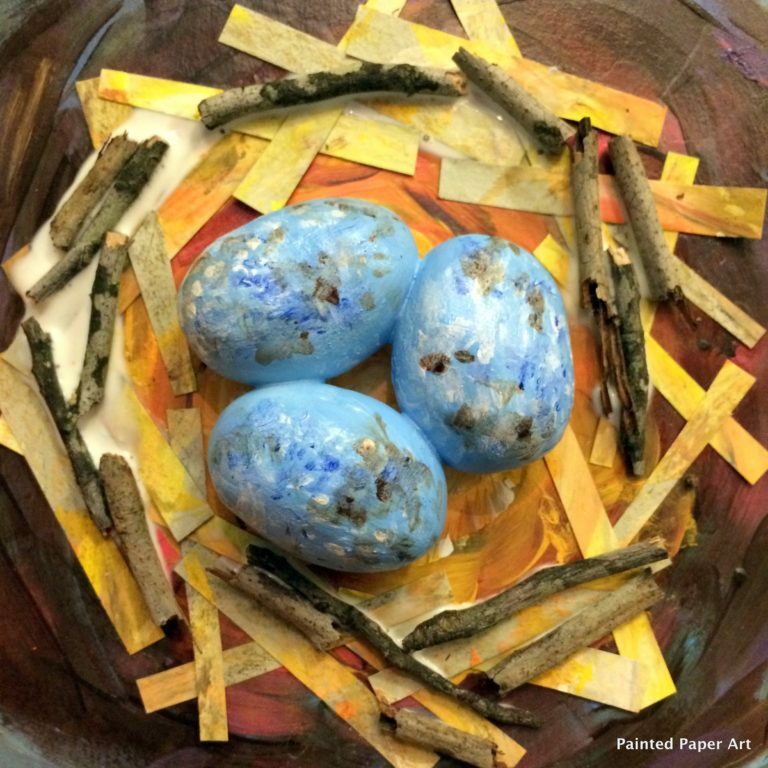 Want to know how to create painted paper? Check out this blog post on Creating Painted Papers 101. Trees were then laid out on inexpensive brown craft paper, overlapped and glued down creating a realistic landscape image. Some simple painted clouds, and a circle sun tucked under some trees at the horizon, were added to complete the mural. In my classroom students often create items that are grouped with other students to create a large collaborative mural. This is a common creative process in our art room and the students love seeing the displayed pieces. They often point and comment on how neat it is to see their individual items displayed as an entire group. Step One: With pencil, draw out a simple shape for your desired tree. Add a fun pattern to your tree. and a strip of painted paper for the trunk. Next, with your tempera paint fill in shapes and patterns on your tree. Have fun with your colors and designs! When your trees are dry, cut around the shape leaving a little border of the cardboard. Grab some modeling clay and stand your tree in the clay. I used modeling clay because it will not mark up my counters and doesn’t dry out. FYI: Be careful where you place your forest, don’t place it on a table where the clay could leave a stain or mark. Set up, sit back and enjoy a cup of cocoa while admiring your delightful forest. Hi very nice picture.! we are organizing a kids event and would love to use that pic as a background, is that okay with you? Hi thanks you very much.! Yes please have a look http://www.tokjo.ch/kidsaktiv/. We are very happy and grateful for your artwork. Hi! This is Stacey from Expressive Monkey. Your lessons are just beautiful! I’ve enjoyed looking at your blog and pinning things to my Pinterest board. I want to make my own patterned trees, just for fun! 🙂 BTW I sent you a Facebook message this evening. Hi there! Every thing is beautiful! I would like to do these projects with a couple of my art classes. Can you tell me where you find the thin cardboard sheets for your trees?